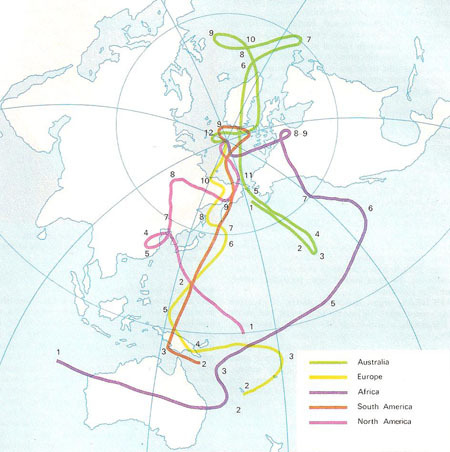 Polar wandering curves for the various continents through geological time based on paleomagnetic data. The numbers refer to: 1. Precambrian; 2. Cambrian; 3. Ordovician; 4. Silurian; 5. Devonian; 6. Carboniferous; 7. Permian; 8. Triassic; 9. Jurassic; 10. Cretaceous; 11. Tertiary; 12. Quaternary. Since these curves, which describe the apparent positions of the north magnetic pole as determined from different continents, are not only colinear but also show remarkable differences of form, the only apparent explanation of polar wandering would seem to be that the continents have moved relative to each other. Paleomagnetism is the study of past changes in Earth's magnetic field (see geomagnetic field) by examination of rocks containing certain iron-bearing minerals (e.g., hematite, magnetite). Since the "magnetic memory" of rocks is measurable, this determines their orientation in relation to magnetic north at the time of their solidification. The Earth's polarity has reversed at least 20 times in the past 4 to 5 million years; earlier changes cannot at present be determined. Reversals of the field and movements of the magnetic poles can be charted and information on continental drift may be obtained. The gross displacement of large rock formations as measured by their magnetic qualities can be explained by seafloor spreading.